Read the Thank you letters from 2003 Girls State graduates Shannon Klaus and Erin Jenkins. You may also view Jeremy Borchelt's 2003 Boys State Presentation on line. 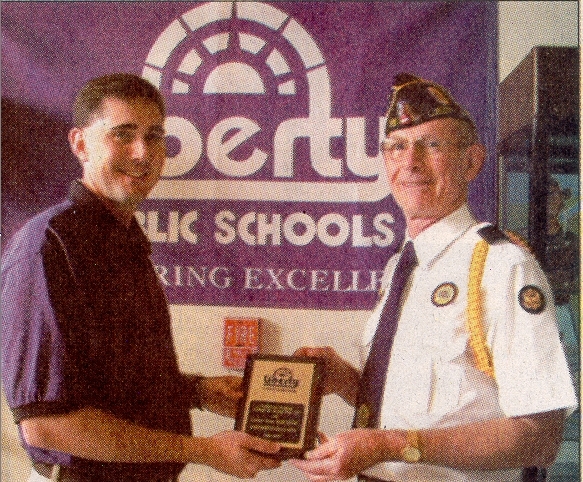 SCOTT CARR, Liberty Junior High School principal, Presents a Partners in Education plaque to Paul Ellison, commander of the Robert H. Baker American Legion Post 95 in recognition of a long-standing relationship between the two institutions. The local American Legion post sponsors and presents citizenship awards to select 8th and 9th graders at the end of each school year. Partners in Education is a formal, voluntary relationship between Liberty Public Schools and the Liberty community for the purpose of educational improvement.